This product requires the base game Castlevania: Lords of Shadow 2. Gives you the exclusive Transmutation Rune which allows you to absorb any of the game's relics and transform them into one of your choice. The Transmutation Rune allows you to always have the best one at your disposal for any given situation! Note: This ability only becomes available once you have picked up your first relic and you can only transform a relic into one you have already discovered. © 2014 KONAMI Digital Entertainment. 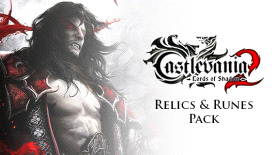 “Castlevania" and "Lords of Shadow" are trademarks or registered trademarks of Konami Digital Entertainment Co., Ltd. KONAMI is a registered trademark of KONAMI CORPORATION. Uses Bink Video. Copyright © 1997-2014 by RAD Game Tools Inc. FMOD sound and music system, copyright © Firelight Technologies, Pty Ltd. 1994-2014. Lua 5.1 Copyright © 1994-2014 Lua.org, PUC-Rio. NVIDIA and PhysX, both stylized and non-stylized, are trademarks or registered trademarks of NVIDIA Corporation. Copyright 2014 NVIDIA Corporation. Dolby and the double-D symbol are trademarks of Dolby Laboratories. ©2014 Valve Corporation. Steam and the Steam logo are trademarks and/or registered trademarks of Valve Corporation in the U.S. and/or other countries. All other copyrights or trademarks are the property of their respective owners and are being used under license. Created and developed by Mercury Steam Entertainment s.l. and published by KONAMI. Unauthorized copying, adaptation, rental, lending, re-sale, arcade use, charging for use, broadcast, cable transmission, public performance, distribution or extraction of this product or any trademark or copyright work that forms part of this product is prohibited.